Bugatti, bien sure. But you’re thinking only of Ettore Arco Isidoro Bugatti (1881–1947), son of Carlo (1856–1940), brother of Rembrandt (1884–1916), and father of Jean (1909–1939). From grandfather to grandson three generations of Bugattis have made distinctive and distinguished contributions to different branches of the visual arts. Throw in for good measure a wood carver/stone mason and part-time student of perpetual motion as great-grandfather and Carlo’s friend, the painter Giovanni Segantini, and you have an exceptionally stimulating environment. In the context of their time (i.e. family structure, learning a profession, mobility) passing a tradition or skill from father to son was the rule rather than the exception. But such circumstantial factors, even if coupled with the conditioning of values and sensibilities that is attributable to the influence of role models and force of habit, do not make inevitable the Bugattis’ unusually creative dispositions. Rather, author Henry Hawley sees an artistically inclined gene pool at work and reminds us of similar constellations in the cases of the Pissarros, or Nicholsons, or Wyeths. The late Robert Bergman, Director of the Cleveland Museum of Art writes in his foreword that “the great car designs of the 1930s relate to a tradition of artistry and design including sculpture, drawing, furniture, and decorative objects that extends well back into the previous century.” It is this cross-pollination the book explores. Well before there were cars and Motor Shows, London’s Earls Court hosted all sorts of exhibitions. Long before a Bugatti car was seen at Earls Court, Carlo Bugatti exhibited his furniture at the 1888 Earls Court Italian Exhibition (and was awarded a diploma of honor for it by the organizers). Hawley is curator of Renaissance and Later Decorative Arts and Sculpture at the Cleveland Museum of Art. This is the first American exhibition to showcase the work of three generations of the Bugatti family and brought together six cars, including a Baby Bugatti electric car, 20 modeled animal sculptures and some drawings by Rembrandt Bugatti, and 38 examples of Carlo Bugatti’s furniture and cast metal work, chiefly in silver, along with plaster models and drawings by him. 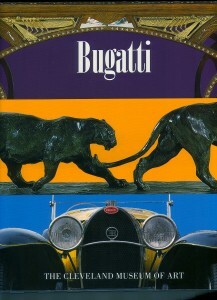 Supplemented with essays by Véronique Fromanger des Cordes of the Conservatoire Rembrandt Bugatti in Paris and Motor Sports contributor Mickey Mishne of the Bugatti Owners Club of England and the American Bugatti Club, this book is the catalog of the CMA Bugatti exhibition, 18 July–19 September 1999. The exhibition, and this catalog, demonstrate the invaluable service museums provide by bringing together under one roof artifacts that are rarely seen together. An individual writer can travel to the ends of the earth, document widely scattered material and then present to the world a synopsis in words and images of what he found. But until future advances in computer-modeled 3D Virtual Reality (such as the Getty Museum experiments with) are actually able to simulate scale, dimension, and even tactile properties or smell, a museum is the closet thing to being there (however, if you can’t resist the urge to “reach out and touch somebody,” the only tactile involvement you should expect is the museum guard’s hand on your shoulder as you are expedited from the premises). Ultimately it is the financial wherewithal and intellectual credibility a museum can bring to the table that persuades lenders to open their vaults and sponsors to underwrite exhibitions. Hawley’s skill as a curator lies in recognizing the connections among disparate elements and in interpreting the observations in a cohesive manner. 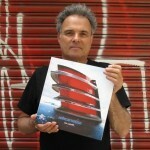 If you missed the CMA exhibition, let this book bring the museum to you. And even if you saw the collection in living color the book is indispensable for providing the order and guidance that your eyes, by themselves, may have missed. 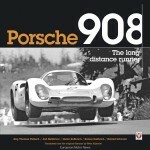 For the serious Bugatti historian this book contains an added treat. Many facts about the family history are obscure and in dispute. Hawley himself notes that “much remains unknown.” It is to this end that he chose to include the, albeit allegedly sanitized but nevertheless relevant, biographical essay Carlo Bugatti, A Reminiscence by L’Ebe Bugatti, Ettore’s daughter, in the original French as well as an English translation. The book itself is beautifully typeset and printed; the illustrations are comprehensively annotated and impeccably reproduced. Museum catalogs don’t often see a second printing—get one while you can still find it.